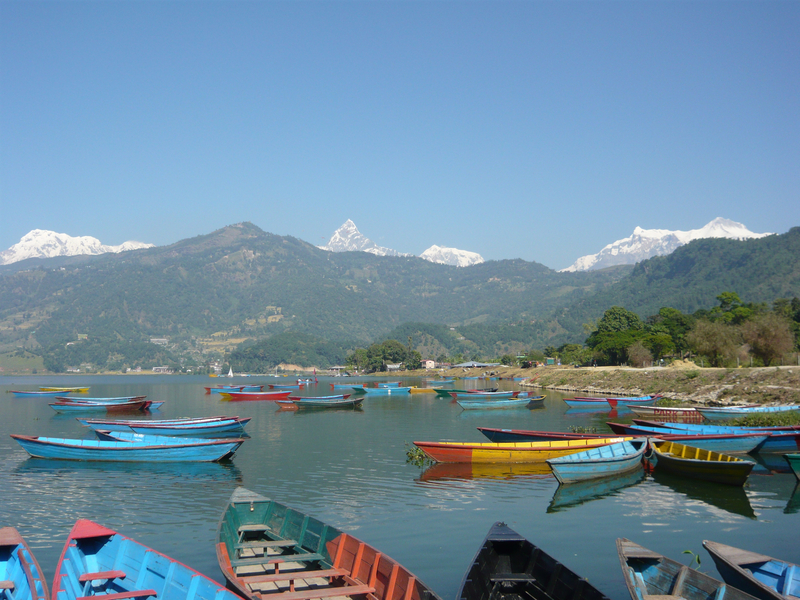 Greetings from Pokhara…wish you were here! Photo above of the stunning Phewa Tal lake in Pokhara, Nepal. Taken in November 2010. After two long, unbelievable weeks trekking the Annapurna trail we landed in sensational Pokhara, one of the most beautiful towns in Nepal. I was mesmerized by the glorious Phewa Tal lake that had the mighty Himalayas reflecting in the water. These colorful boats were one of my most precious memories of the end of our trek and our stay in Pokhara. Some had sunk to the bottom of the lake and were left there to reflect their brilliant hues of blues, reds, yellow and greens up towards the shining sun. I felt true serenity and peace in this place of beauty. I was looking through the travel section of wordpress.com and thought that this looked like Pokhara 🙂 What a beautiful picture! Thank you! I truly love Nepal and hope to visit again someday soon!